To help meet the growing demand for high-tech workers, Trocaire College is launching new academic programs and building state-of-the-art classroom space. Over the next seven years, the Bureau of Labor Statistics is projecting double-digit growth in information technology and data science jobs. 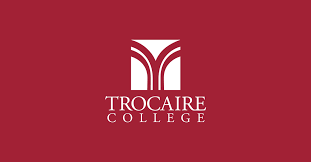 This fall, Trocaire College will begin offering an Associates Degree in Cybersecurity and an Associates in Data Analytics. Vice President of Academic Affairs Allyson Lowe says they're not just for math geeks or coders. "If you're somebody who's interested in asking the why question or if you're somebody who's interested in patterns or analysis in any of its forms, maybe you love literature and you love moving through complicated texts, these are fields that are ripe for your exploration," Lowe said. Lowe says both programs are for entry-level job seekers and for people who want to "upskill their careers." Certificate programs will also be available and offered in the newly established Trocaire College Technology Institute on Transit Road, in Williamsville. She says it includes digital sandboxes for small group projects, a data visualization lab and interactive classrooms. "It's all new technology, all new spaces, and built so that students can simulate the kinds of group and individual work spaces that they will find in their work places," she said. Lowe says technology classes are also be available at Trocaire's Main Campus, in South Buffalo, and online. Trocaire College has been awarded the Health Resources and Services Administration’s Nursing Workforce Diversity Grant. The $1.8 million grant will help the college recruit and retain nursing professionals from disadvantaged backgrounds.